Apple noted the investment in a brief statement, saying that "we believe their new fund will speed the development of technologies which may be strategically important to Apple." SoftBank's CEO, Apple, and Foxconn have been intertwined for some time, and Apple reinforced these connections with Wednesday's statement. 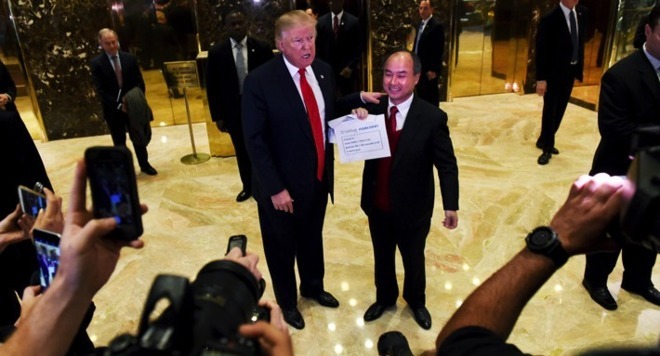 SoftBank founder and CEO Masayoshi Son met with President Elect Donald Trump at the presidential transition team offices, located in Trump Tower in New York City, to discuss the Vision Fund. At the time, Son made a verbal agreement with the President-elect to invest $50 billion into U.S. businesses. Trump claims that the deal would not have been possible had he not been elected. At this point, it is not known how many investors have contributed to the fund, but according to SoftBank, the fund is "oversubscribed" with potential investors, and will officially launch in the next few weeks. SoftBank has contributed $25 billion to the fund, with the Saudi Arabia government chipping in $45 billion. According to the Wall Street Journal other investors interested in the fund are the sovereign-wealth fund of Abu Dhabi, the Qatar Investment Authority, and Qualcomm. Shortly after Trump's Tweet announcing the potential $50 billion deal with SoftBank, Son was seen carrying a paper trumpeting a U.S. deal involving it, and Foxconn. Foxconn declared that they would announce details of any plans "following the completion of direct discussions between our leadership and the relevant U.S. officials" and would be based on mutually agreeable terms.